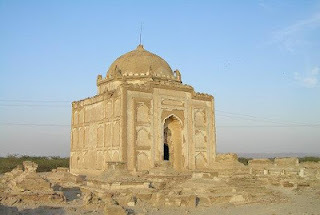 Qadir Bakhsh-jo-Qubo is situated some sixteen miles south of Rohri in Deh Akbarpur Jagir. It covers an area of thirty-five acres and contains many ancient graves. The principal grave belongs to His Highness Mir Suhrab Khan of the Khairpur Mirs. He died on 27 Rajab AH 1280 (AD 1863) at the age of ninety. Next to it lays the grave of His Highness Mirs Rustam Khan of the Khairpur Mirs. He died in AH 1297 (AD 1870) in Poona (Pune) and his body was brought here for burial. Nearby are the graves of Mir Dost Muhammad, the second son of Mir Khan Muhammad Talpur ( d. AH 1262 [ AD 1846 ] ), and of the mother of Mir Ahmed Ali Khan Talpur. To the east of the graveyard is a mosque constructed by the Talpurs. There is another mosque some two hundred feet away, constructed by the British government. Attached to this mosque is the government musafirkhana, (traveller lodge). Today, both the mosque and the musafirkhana are in ruins. Shikarpur in AH 1249 (AD 1833). On the eastern side of the tomb of Fakir Qadir is the tomb of Syed Saleh Shah, of whom nothing is known, and to the west of it, a mosque which is said to have been constructed by Fakir Qadir Bakhsh himself. The village has a population of approximately 500 individuals, who live in fifty houses.